We offer a wide range of FRC and PPE items. 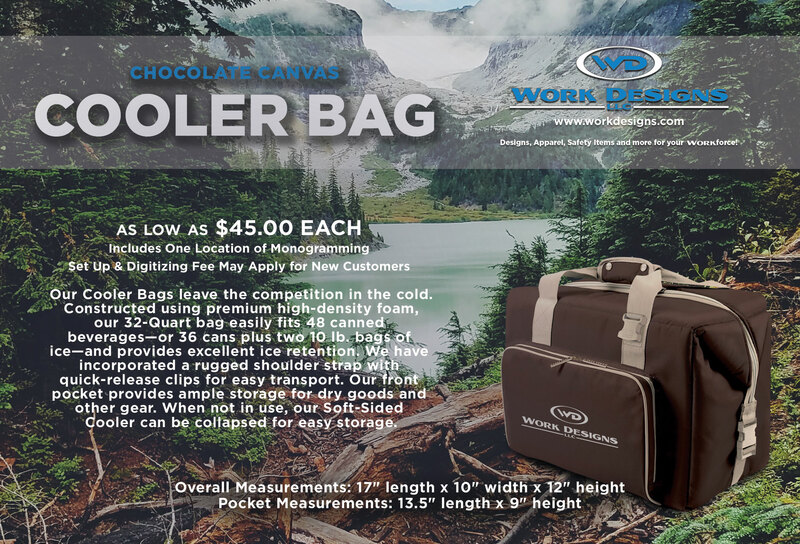 Work Designs offers a variety of products to help you expand your business as well as keep it running safely and efficiently. From signage and vehicle decals to promotional items and even protective clothing, our goal is to offer you an easy way to outfit your business so that you can get to work right away. Do you need custom business cards or t-shirts? We have you covered. We can even work with you to produce an online store where your employees can order company uniforms and customized items from at home or in the office. Our professional staff can provide in-house screen printing, embroidery, graphic design, and more! Our Cooler Bags leave the competition in the cold. Constructed using premium high-density foam, our 32-Quart bag easily fits 48 canned beverages—or 36 cans plus two 10 lb. bags of ice—and provides excellent ice retention. We have incorporated a rugged shoulder strap with quick-release clips for easy transport. Our front pocket provides ample storage for dry goods and other gear. 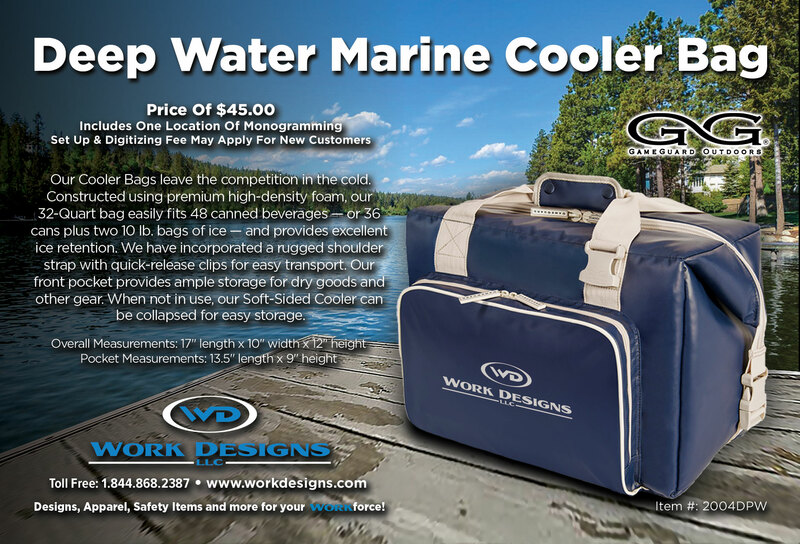 When not in use, our Soft-Sided Cooler can be collapsed for easy storage. • Price includes one location of monogramming. • Setup & digitizing fees apply for new customers. Work Designs produces custom signs and banners to suit any and all of your business needs. Our professional designers and sign makers use the latest equipment to produce and install a variety of signs, custom made for you. We make and install weather resistant decals that are made with the best industry-standard materials. Our large-format printers can output full color decals for vehicles as well as hard hats, windows, walls, and more. Work Designs helps businesses to reach out to customers through customized promotional products. 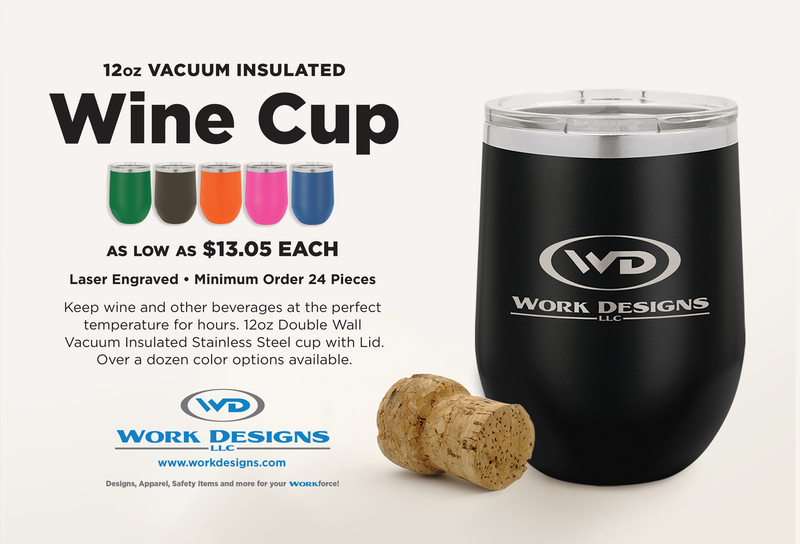 We offer over 650,000 ad specialties such as pens, USB drives, cups, bottles, folders, notepads, koozies, and much more. Work Designs offers name brand office apparel that our embroiderers can customize with names and logos. Whether you need uniforms, dress shirts, or casual office apparel, we provide a wide range of colors and styles. We can outfit your workforce with the best brands in the industry customized with logos, names, patches, etc. We offer everything from brand name work boots to flame resistant (FR) pants, shirts, and coveralls. We can also help your workforce to stay safe with personal protective equipment (PPE). Work Designs offers a wide selection of "head to toe" safety gear such as hart hats, glovesm ear plugs, vests, and more. 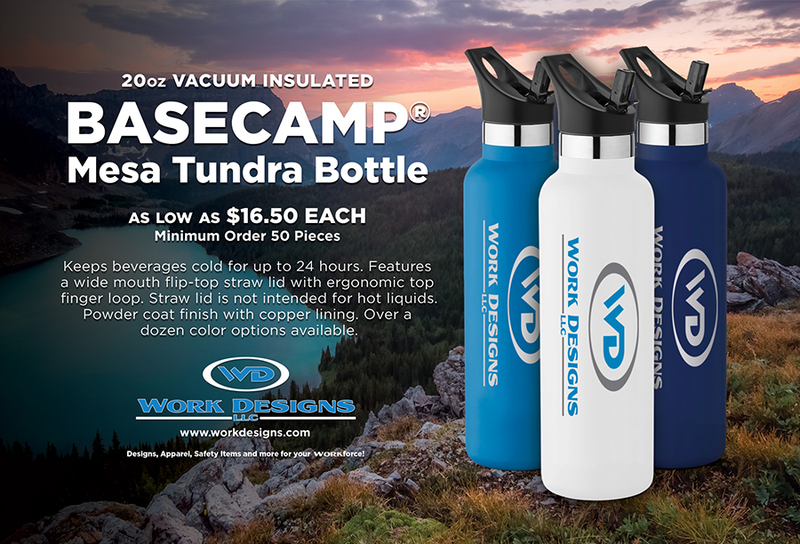 Keep beverages at the perfect temperature for hours with our custom printed vacuum insulated drinkware. We offer custom engraved tumblers, sports bottles, wine cups and more. Dozens of color options available. With multiple in-house graphic designers, we can help you to achieve the perfect look for your logo, product, or brand. Our art department operates the latest industry-standard software and our designers have decades of design and pre-press experience. Our in-house screen printers are able to produce full-color photographic prints on our 8-color press. We can design and produce produce both single and multi-color imprints on t-shirts, uniforms, and various apparel. Work Designs offers professional in-house embroidery and monogramming services on shirts, bags, uniforms, hats, jackets, towels, and more. We use advanced equipment to provide our customers with first-rate embroidery, emphasizing detail and craftsmanship. Our business printing options include both spot and full-color flyers, envelopes, business cards, NCR forms, booklets, brochures, notepads, and much more. Work Designs uses CNC routing to sculpt dimensional lettering and engraved surfaces on a variety of materials. We offer CNC routing services for many applications, from sculpted signs to stencils and plastic machining. Our customized online stores make ordering easy for individual employees or members of your organization, whether as a virtual storefront for employees to order uniforms or as an online interface to simplify your office's ordering process. Work designs offers a wide variety of products and services in order to keep you working. Search through thousands of ad specialty and promotional items or browse through our selection of product and apparel catalogs by clicking here.